More Visual Puns: "Phantoms of the Opera"
One thing that the pair does not represent is, "It ain't over 'till the fat lady sings." 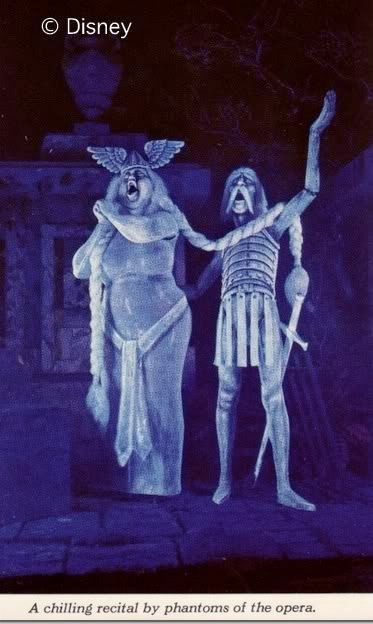 Someone might think that this is the cliché represented here as a visual pun—with "over" understood in a particularly macabre sense—because the operatic duo really are near the end of the ride, but the "fat lady" phrase appears to be a recent coinage, not firmly attested earlier than the mid-1970's. 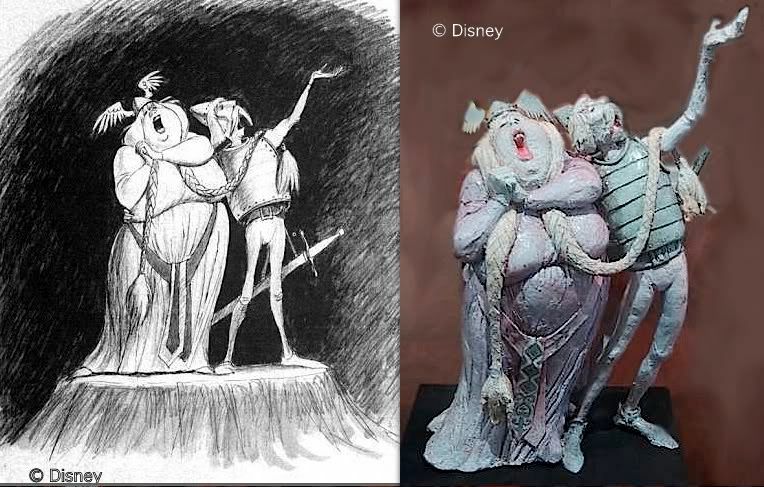 The phantoms of the opera went from Marc Davis's original sketch to maquettes to finished figures with less alteration than practically any other characters in the HM. Marc just flat-out nailed it, and no one could improve on it. It almost makes these characters boring to blog about. They sure are fun to look at, though. If they're fun to look at, they're even more fun to listen to. For some unfathomable reason, the WDW Mansion has replaced the original with a new recording, but thankfully, Disneyland still has the original, recorded Feb 13, 1969. The singers were Bill Reeve and Loulie Jean Norman Price. The music director, Buddy Baker, knew that these two were seasoned professionals and that they had the basic "Grim Grinning Ghosts" tune down pat, but he told them they were supposed to be some kind of nut cases and that they should improvise freely. Go on kids. Get crazy. He needn't have worried. They weren't shy. Or maybe they were drunk? Whatever it was, they gleefully jumped in and delivered a performance right out of the locked ward. Both singers are great, but I think the female half steals the show. Shhhhh...listen! 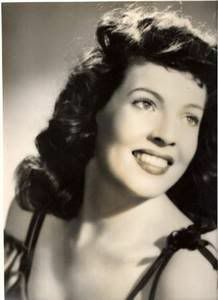 You've heard the warbling soprano of Loulie Jean Norman Price before. You know the warbling soprano in the background of the Tokens' famous hit, "The Lion Sleeps Tonight"? Yeah, that's her. The warbling soprano you hear in the Star Trek theme? That's our Loulie. Around Hollywood, it seems she was the go-to girl for warb. sop., especially if you wanted a faintly spooky edge. All kidding aside, the lady had a great set of pipes. She had a long professional career, at Disney and elsewhere. There is a rather charming memorial site for LJNP, who died in 2005. *I can't find the attribution for this photo. If it's yours, contact me, and I'll give you full credit or take it down at your option. I did a photoshop to give y'all some visual idea of what the original backup effect looked like. From the relevant blueprints you can tell for sure that there was some kind of projected effect involving objects moving from mirror to mirror, and that they undulated, thanks to a curved screen. 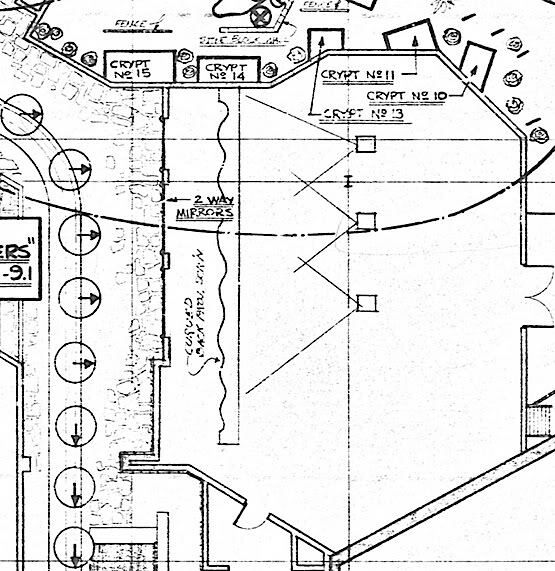 What you can't tell from the blueprint is what the content of the projection was. One of them says "Ghost Images," but that's all. For anything more detailed than that, we have no other source right now than my memory. So...is this re-creation accurate? Can you take it to the bank? You can, but you'll need three forms of ID, a blood sample, and a notarized statement from your mother. "Great Caesar's Ghost, Why Would Anyone Want to Annotate a Joke?" 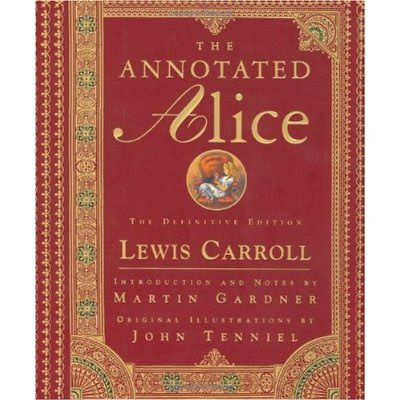 One of my all-time favorite books is Martin Gardner's The Annotated Alice, an edition of the classic Lewis Carroll stories with hundreds of notes that explain the "jokes, games, puzzles, tricks, parodies, obscure references, and almost endless curiosities" right alongside the texts. Gardner admits that a book like this is a peculiar undertaking in the very first line of the Introduction: "Let it be said at once that there is something preposterous about an annotated Alice." But as Gardner explains, no joke is funny if you don't get it, and getting a joke sometimes requires some background. After all, there is a considerable gap between us and an ordinary Englishman of the 1860's, and the wordplays and allusions in the Alice books are often extremely subtle and erudite. Gardner's annotations greatly increase your appreciation of Lewis Carroll, and no, the magic is not diminished one bit. It doesn't take a rocket scientist to see where this is headed. I think the HM would be well served by the Martin Gardner treatment. There is certainly no lack of interesting material to annotate. But! Someone might object that yes, of course there is a cultural chasm between 19th c. England and us, but is it really the case that stuff from as recent as 1969 needs help before we can understand it? The answer is yes, for two reasons. First, the Imagineers who conceived the HM were not youths. Occasionally, their ideas of pop culture spring from sensibilities of the 40's or even the 30's, not the 60's. Second, they could assume that audiences were generally familiar with things that—alas!—can no longer be found in the public square. This is true for the whole park. When Disneyland opened, everyone had read Tom Sawyer in school. Today? Not so much. It happens to be true that there is a lot in the HM that goofs on things that have been largely forgotten by the general public. Here's a quick and easy example. For his 1958 HM walk-thru, Ken Anderson conceived a ballroom scene with various ghosts from history and literature schlepping around and having a good time. 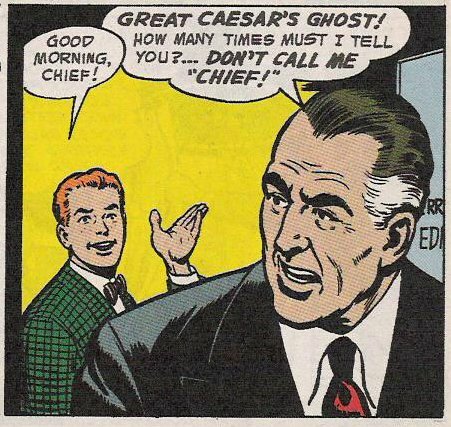 One of them was "Great Caesar's Ghost." 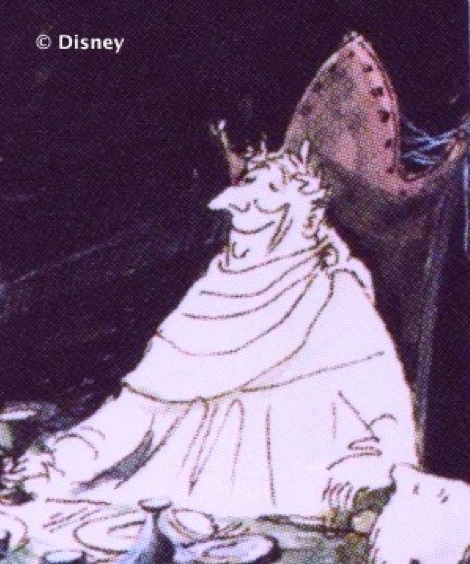 Marc Davis thought that was pretty cute and incorporated the character into his concept art for the ballroom. As we all know, Caesar made it into the final product. 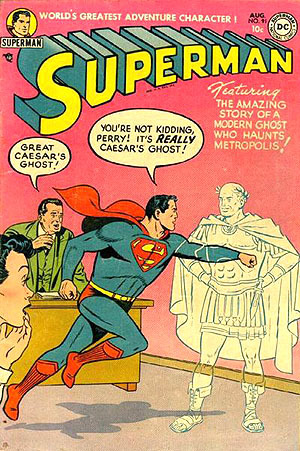 But lots of people in the 40's, 50's and 60's were very familiar with it because Clark Kent's editor, Perry White, used it all the time, both in the comics and on the Superman TV show. Perry White's verbal tics have been off the radar screen of pop culture for a long time. I'll bet that over 90% of the people who ride the HM have never recognized the visual pun represented by this character. Perhaps they could salvage a gag out of the situation by putting a salad on his plate? 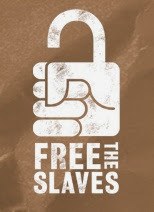 Until then, face it, general public, YOU NEED THIS BLOG. follows and adds details (in red). Updated August 29-30, 2013 and May 1, 2014. You know the drill. 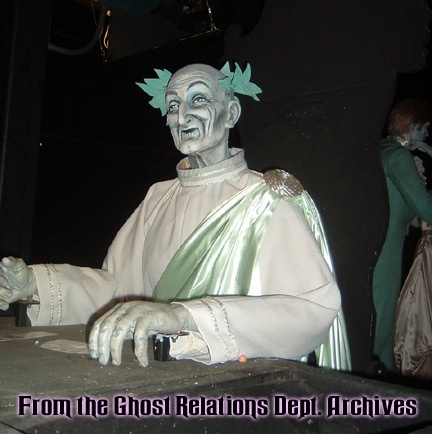 As the show winds down, you go past a set of mirrors, and in the mirrors you see one of the hitchhiking ghosts sitting beside you. But it was not always so, says I. 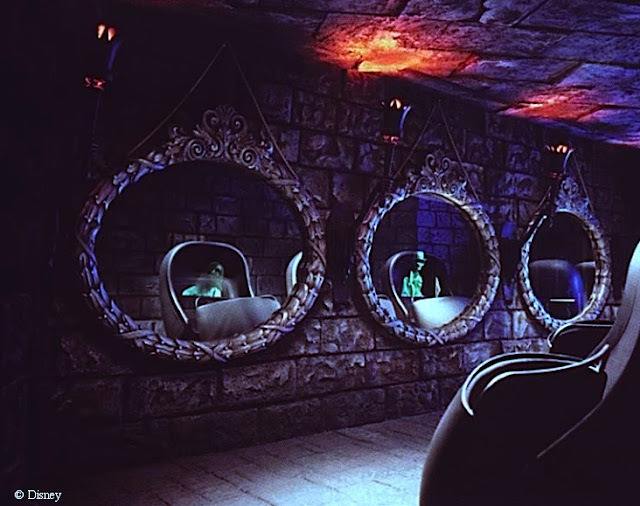 If you rode the HM during its opening week, you would have seen something else in those mirrors. 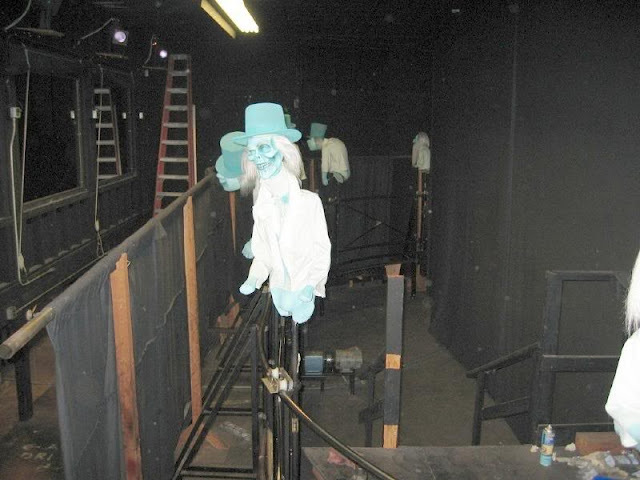 This was the original "Long-Forgotten Haunted Mansion effect," and it remains one of the most intriguing. I rode the HM on Thursday, August 14th, 1969 (I was 14). There's a lovely story about how I got to ride during opening week, but that's for another time. There has also been a mighty tempest over when exactly the HM first opened, but that's another post as well. Going past the mirrors, what I remember seeing is clouds of faceless, wispy spirits surrounding and mobbing the doombuggy. They were undulating and following along with you as you scooted past. Very cool. But on my next visit, no more than a few weeks later, the wraiths were gone, and I was startled to see the familiar effect that we have there now. "Hey, that's different!" was my reaction. ...came to my attention. One of the participants in that chatboard discussion mentioned a HM effects blueprint in his possession with some curious items on it. He graciously sent me a copy. Eventually I was able to get a much cleaner copy of the same b-print (thanks to Datameister at Micechat). Whoa. This b-print is dated 4-8-69. The original date on the other b-print is illegible, but it was updated on Feb 7, '69, and its last update was 4-7-69, the day before the other b-print was produced. Thus, our projector system is on a b-print that was the direct successor to one which shows the effect as it is seen today. 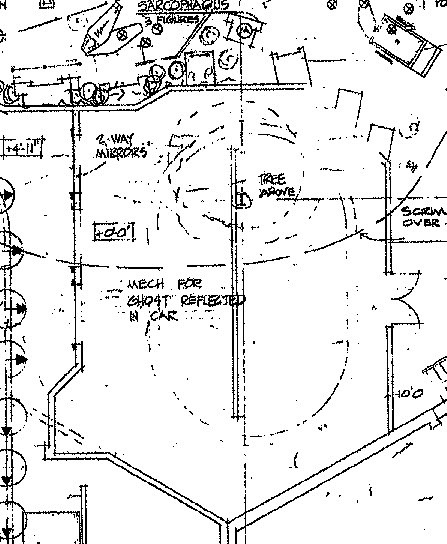 Even without this info, it is plain that the ghosty-go-round was always what was planned, since the room itself is obviously shaped around it. In contrast, the projector system obviously does not fit the room very well. Look at all the wasted space. So, what gives? Why does the effects b-print which is actually closer to opening day have this funky substitute? What is this "peering into the fog" business? And why does he apparently see only himself in the doombuggy? Hmm. The wraiths I remember did indeed look like a swirling cloud of spirits. Now the evidence is getting murky again. How do we reconcile Mosley and Murray? 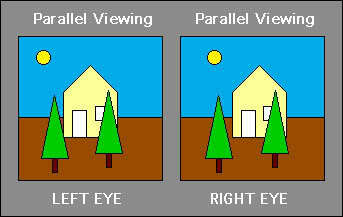 Assuming they are both providing good faith, reasonably accurate accounts of what they saw, there is only one way to do it that I can see. Mosley is explicit that she rode the HM at the midnight press preview Aug 11/12. Her review appears on the 12th. Murray nowhere claims to have been at that preview, and his review appears on the 13th. 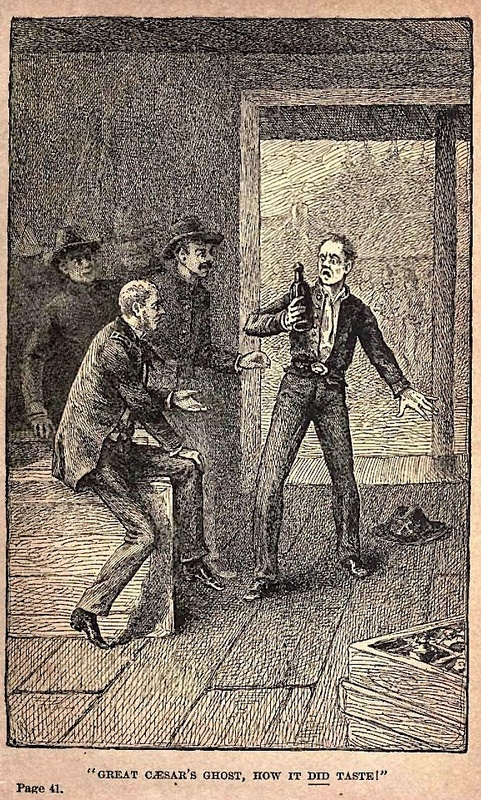 It is possible that he rode sometime during the day of the 12th and wrote his review for publication the next day. Mosley's and Murray's rides could have been 12 hours apart, or even more. Was the ghosty-go-round there for the midnight showing and then hastily replaced by our projected wraiths? That would explain it, but is there any warrant for such a scenario? 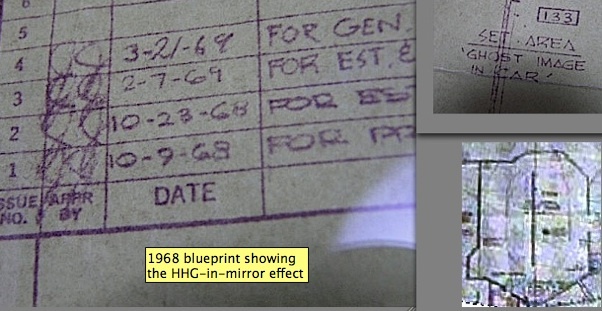 Edit: In 2014 this 1969 schematic came to light, showing both of the effects superimposed, exactly like above. And why would they need this backup? Because if the ghosty-go-round goes down, they will douse the lights on the motionless hitchhikers, and now you've got the guests riding past mirrors looking at themselves and nothing else. That's intolerably dumb. You have to put something there. You need a backup effect if the planned one fails. Did they anticipate such a failure? You bet they did, that's what the blueprint is all about. In addition, there is the intriguing comment made by show author X Atencio in Storyboard magazine. Speaking of the HHGs, X said: "It was kind of an afterthought, though. It didn't come until the ride was practically put in there." 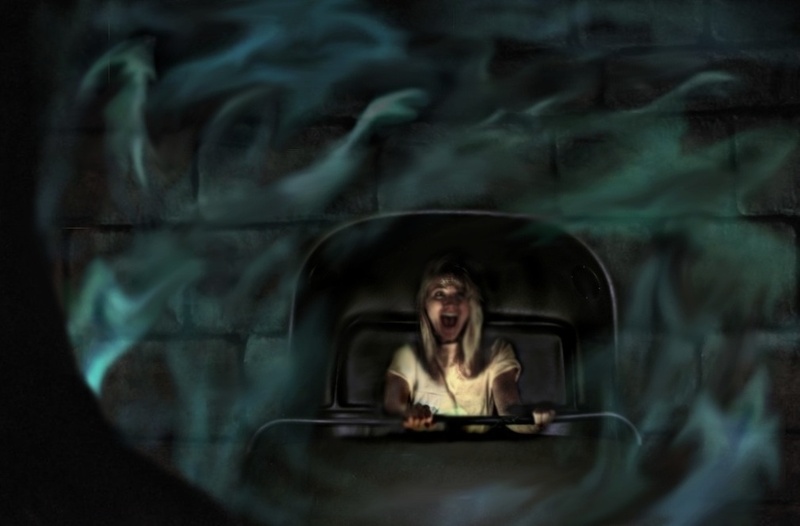 Based on this, both Doombuggies.com and Surrell's Haunted Mansion book (at the time of this writing the two most authoritative sources for all things HM), claim that the HHGs were a last-minute addition to the ride. Bull crap. The problem with X's remark is that what it says is literally impossible. 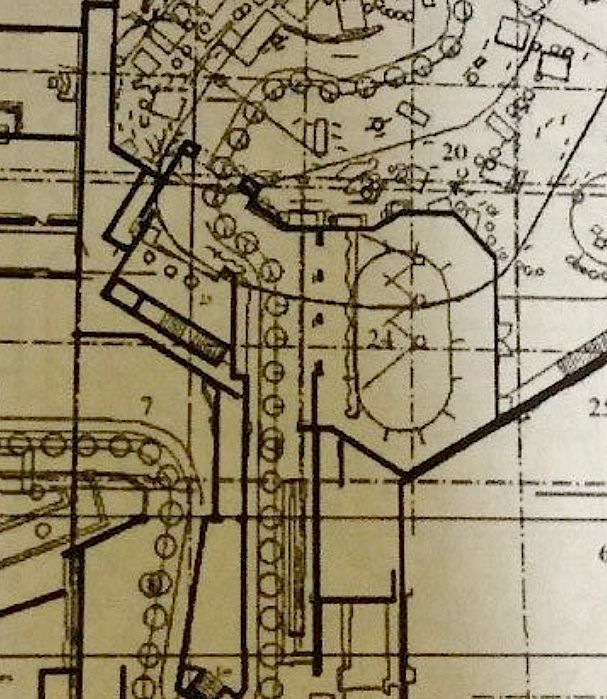 The show building went up in 1968, and the HHG-in-mirror gag is plainly visible in 1968 blueprints. The idea itself is much older, going back to Ken Anderson's plans for a DL haunted house in 1957-58. Guests walk down a hall with mirrors on each side showing ghosts accompanying them. Traveling ghosts looping around a central barrier that hides their return, coupled with clever use of two-way mirrors—yep, it's all there. The best explanation for X's flub is that the originally-planned HHG effect—the one that is there today—did not look like it was going to be ready by opening day. The problem could have been something as simple as an unavoidably delayed shipment of a vital part. So a temporary effect was worked out and constructed, something to have in the mirrors until whatever demons were ailing the Gus-Ezra-Phineas show were exorcised. (We now know that this backup effect was built in the middle of April.) 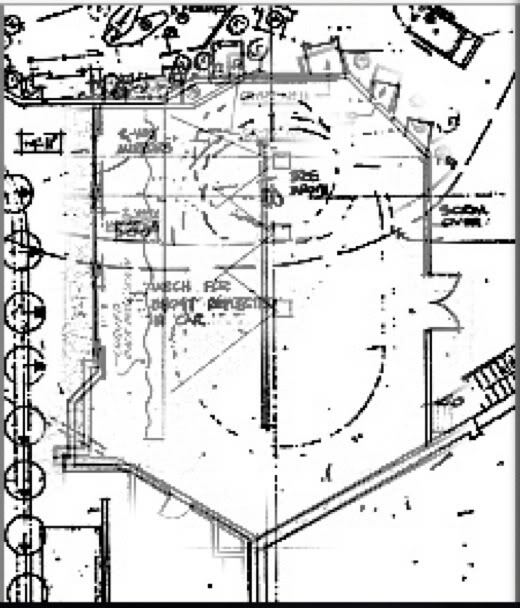 But the Imagineers wanted to show the press what the permanent effect was going to look like once it was up and running, so they managed to get the ghosty-go-round jury-rigged and working for the midnight showing, and then they immediately went back to their backup. They were still using that on Thursday when this geeky teen rode. I suppose that X's memory of this frantic mess was a little hazy, and that's why he spoke misleadingly to Storyboard. How did the backup effect work? If I may speculate, it was yet another example of Yale Gracey genius at work. 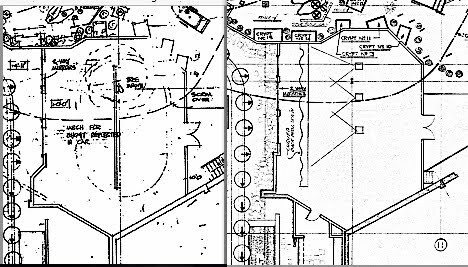 The projectors were the same as the ones Yale invented for use in the Blue Bayou lagoon (the clouds moving on the "sky") and used again in the HM for the misty clouds moving along the wall in the Limbo loading area and on the scrims in the graveyard. The wavy, curved screen was 40 feet long and 12 feet wide. It was back-projected with these moving ghosts. The curves made them undulate and gave them animation. They were bright enough to be seen in the mirrors against the dark outside of your doombuggy, but were washed out and therefore invisible against the much brighter interior where you sit. This delicate balance was achieved by adding new lights, both in front of the buggies (spotlights) and behind them (new fluorescent lighting). 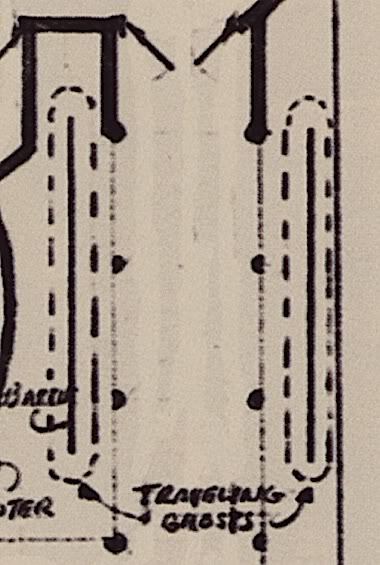 Records show that these were installed at the same time that the backup effect was constructed, as part of the same project. 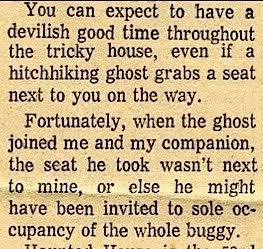 Thus, the ghosts looked like they were surrounding and mobbing you, but they were not inside the doombuggy with you. There's a photoshop recreation of the effect HERE. Whew. All that for that. We had better tackle this issue right up front. How can anyone take an amusement park ride so seriously that they end up writing reams of material about it, probing every nook and cranny and occasionally getting, you know, all philosophical and stuff? Is this not evidence of arrested development, if not a disturbed personality? Get. A. Grip. It's. A. Ride. ...albeit a very good one. Sure, it's a fine piece of entertainment that obviously took a lot of work and displays a lot of creative ingenuity, but c'mon, it's not art. Or Art. Or Awt. The line between art and entertainment is, of course, a porous one. Good art typically entertains, and good entertainment requires some sort of artistic skill. In light of this overlap, it has been graciously decreed that if "mere" entertainment rises high enough, it may earn the designation, "popular" or "folk" art, but that's all the concession you rabble are going to get. Now get the @#&*!! out of our museum, and next time wear a tie. Unfortunately for the museum curator, the already porous line has become increasingly swisscheesified during the course of the last century, and the holes have been punched from both sides: you've got popular entertainers who expect to be respected as artists, and you've got "real" artists who see their role as essentially transgressive and so ridicule any received wisdom, even when that wisdom supposedly elevates their own work above common graphic design, or "commercial" art, or propaganda, or folk art, or entertainment. 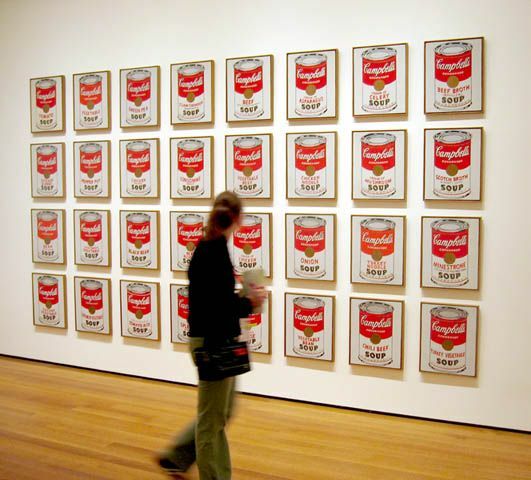 Andy Warhol's Soup Cans make the point as well as anything. Walt Disney was uncommonly shrewd about this issue. I don't think he ever claimed that what his studio was producing was Art with a capital A. No, what you got was a self-deprecating shrug and a claim to be nothing more than an entertainer. Even his most blatant bid for artistic respect, Fantasia, bills itself only as "a new form of entertainment." Of course he knew better. It's not just the fact that his studio artists were capable of moonlighting as "real" artists, and did so from time to time; it's that they all knew darn well by the end of the 1920's that animation was a genuine art form, and that eventually the world would figure that out without them telling it so. And of course, it did. Same thing happened with jazz and with popular cinema. So is the Haunted Mansion art? If so, what would you call it? Giant kinetic sculpture? A form of puppetry? Mechanical theater? The genre does have a name: dark ride. That will have to do, and perhaps it's good enough. Yes, it's art. It passes the duck test. It acts just like art. It uses artistic media and was produced by people who were—many of them—accomplished artists by the most stringent definition, but it also passes a stricter test: the distinction between fine art and graphic design, or illustration. This distinction was still in use when I was taking art courses, back in the middle ages. Even if you don't buy it, it can still be articulated. The difference between a painting of a tree that is Art and one that is merely Very Good Illustration, is that the wordless whammy, the wow factor that tells you that this is good stuff you're looking at, remains intact if it's Art even after you have come to fully understand the technique, but that quiet dazzle sorta evaporates if it's only Illustration. Both of them have succeeded (at least a little) in their attempts to be a haunted house (like Nature is already, without even trying), but if we examine the painting closely and figure out what was in this painter's bag of tricks, the ghosts leave the "mere illustration" but not the "art," which continues to amaze us even more because the house somehow remains haunted even after you've seen the wires and trap doors. This sort of analysis has fallen on hard times, not because it is incoherent but because it is so subjective. 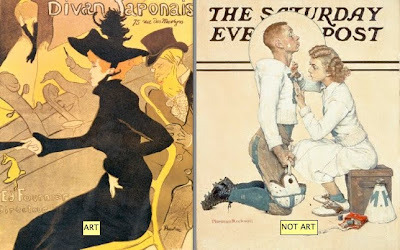 We have been told that Toulouse-Lautrec's cabaret posters are fine art, while Norman Rockwell's magazine covers are merely good illustrations, and too many of us have begun to suspect that we are being snowed. 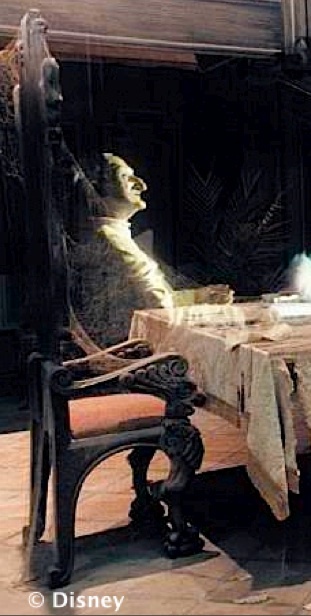 It doesn't really matter, because if the "Long-Forgotten" thread proves anything, it is that exhaustive attention to the techniques behind the Haunted Mansion does not seem to diminish the magic. We've known since we were little kids that it's not really haunted, and we don't care, because...yes it is. It's also art because if you pull on this particular thread, you find that the rest of the universe is attached to the other end. It may be the oddest of oddball entry points, but this too can lead you into some pretty lively discussions with others (or with yourself, if you're prone to such things), the kind of pursuit that leaves you at the end of the day amazed once again at the puzzling wonder of being human. 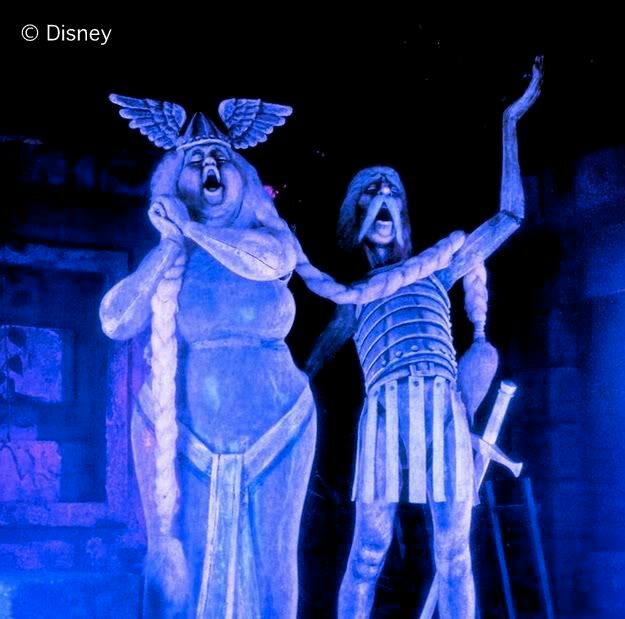 No one is going to argue that the Haunted Mansion is on a par with King Lear or the Sistine Chapel, but in its own way it does what a good poem is supposed to do. If you're still not convinced, then start making your way through the endless "Long-Forgotten" thread, or just hang around here for awhile. The worst that can happen is that I prove to be a very foolish mortal indeed, but hey, there are a lot uglier ways to go about doing that than this. No, I'm not going to say, "Welcome, Foolish Mortals"
But welcome you are, foolish you may be, and mortal, more likely than not. For those of you who don't know the background to this blog, it started with a post on the MiceChat Disneyland discussion board three years ago. 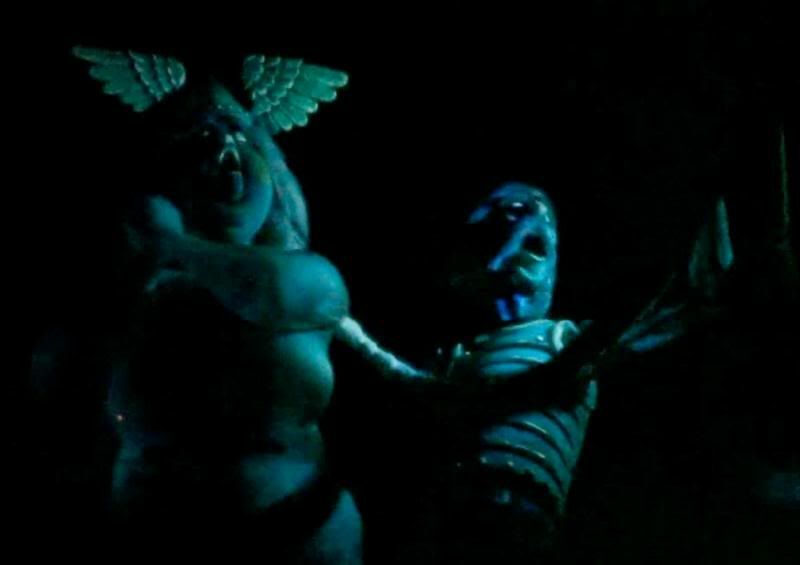 I was trying to discover whether anyone else remembered a short-lived special effect from the early days of the Disneyland Haunted Mansion. Once the discussion began, it never ended. 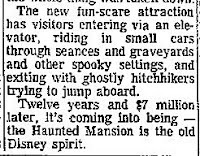 Fans of the Haunted Mansions in the various Disney parks collected like flies on a No-Pest strip. Many of them were and are quite knowledgeable (the fans, not No-Pest strips). There are even Disney Imagineers among the readers. As of today, the "Long-Forgotten" thread (aka "the Thread") runs over 12,500 posts with over 540,000 views. I figure it's time to move this weird and wonderful phenomenon to a more stable format. These days, what you need to know in order to blog has been dumbed down to the point where even a Luddite like moi can manage. I think. The "Long-Forgotten" thread is hardly a one-man show. I am especially grateful to HM experts and collectors out there who have enriched the Thread with their photos and information, but I am grateful too for the energy and insights coming from all the other contributors, too many to name. You guys know who you are.